The third edition of Lens Curator's third season brings you 5 new excerpts from the world of photography and videography. This month we take a look at new Sony A7S III, lighting setup for portraits, 5 small LED lights for your studio, how are cinema lenses made and 7 tips for faster editing. Customer journey doesn't start with the purchase, but with designers and their ideas on how this process should look like. Customer journey and customer experience are two inextricable processes linked with the design. Exactly for that reason, it's important to think of customer experience and journey in the design phase and tailor the end product for the user a.k.a customer. To facilitate this process and to get closer to the users, designers can use UX laws which are connected with human behavior and psychology. What are current trends in the digital sphere? Some things remained the same as the year before, while other things and novelties emerged as an imperative in digital marketing and e-Commerce. From social media to web development and new regulations affecting almost all businesses on the Internet, here are top 5 new trends for 2018. LiLash is the creator of the world's most coveted eyelash serum. Their goal is to revolutionize the way beauty is approached by redefining eyelashes and eyebrows. LilashPros is an online education and catalogue portal for their registered resellers. Take a look at how we envisioned and built their platform, both for B2C and B2B (vendors) market. Bears are all around us. At this time of writing, bitcoin has failed to defend the lower limit of 10K USD price range, pulling all crypto trends in crunching position. 2017. was an interesting year in the online sphere. Social media, e-mail campaigns, influencer marketing and video content have become an imperative for brand presence and user reach on digital platforms. Some of them were praiseworthy, some were a total failure. We investigated examples of such digital fails and made a list of big NO-NO's in this post. Easy accounting – is it possible? So, you have a great business idea and have decided to start your online business. Your mind is filled with creativity and innovation and managing your accounting is the last thing you want to spend time thinking about. However, that might as well be one of the most important aspects of your business. It represents the heart of presenting your product or service to clients via quotes, and of course managing your invoices and payments in a proper way. Fortunately there are many online solutions you can choose from, and chances are you will be able to find a great fit for your business needs. First edition of Lens Curator's third season brings you 5 new excerpts from the world of photography and videography. This month we take a look at viral photo re-touching, aspect ratios, weather sealing, sky replacement, and DIY kino flos. Games are an essential part of human history and its cultural development. The importance of games in different areas of life and business had been recognized just over 15 years ago when the term gamification was used for the first time. Gamification is a ‘’phenomenon’’ that is nowadays visible almost everywhere - from education, marketing, fitness, business to the routines in everyday life. What exactly is it and what does it include? Two mixed lectures and guest appearances from Belgrade marked the nineteenth WordPress Zagreb meetup (first in 2018)! Hello! We are a multidisciplinary team of designers, developers and content makers building tailor-made web applications. If experimenting, learning and producing high-quality custom applications is “your thing”, than Neuralab is a right fit for you. We are focused on big-scale eCommerce projects and our design team is craving for new web design teammates! Hello! We are a multidisciplinary team of designers, developers and content makers building tailor-made web applications. If experimenting, learning and producing high-quality custom applications is “your thing”, than Neuralab is a right fit for you. We are focused on big-scale eCommerce projects and our development team is craving for new PHP teammates! We've been busy and traveled a lot last year. Like real social butterflies. 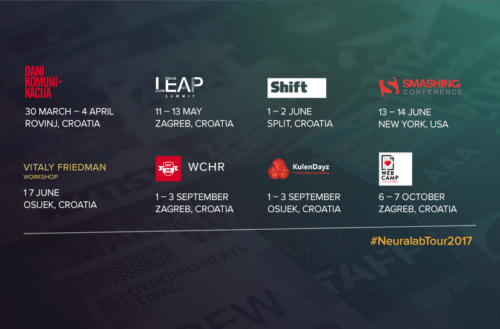 Conferences were ''our'' thing in 2017., so we decided to share experiences and reviews of events linked with Neuralab Tour which was full of interesting places, lectures, and speakers. WCHR2017 attendee quote: "Just pure awesomeness in my honest, humble opinion! The organization was really good, everything went smooth, from the attendee, and speaker’s point of view. The venue was awesome and the catering as well." I have to be honest - I didn't expect much of Webcamp 2107 edition! It has nothing to do with the conference itself or the people behind it, or the speakers, or the venue... It has to do with our Neuralab Tour 2017, and the fact that it was our 8th major conference this year. We were live streaming most of them, we were guest lecturers and panelists on some of them, we were co-organizers on one of them... So we were not mere patrons and consumers, we got to feel the pulse behind each and every one of them. The old saying goes - too much of anything is good for nothing, so I didn't expect to have a blast on WebCamp. December’s issue of Crypto Curator is all about opposing arguments in the blockchain world. Let’s start with general feeling of trust people have in the blockchain ecosystem. Christmas season is pretty tense for every store owner. Much like Santa’s workshop, you need to take care of all the nuts and bolts - working with suppliers, packaging, shipping, double checking customers addresses and inspecting your own warehouse stock... A ton of work for sure. I'm under the impression that companies are not taking GDPR as seriously as they should. If not complied, the penalties will be brutal! Fines up to 20 million Euros, or in the case of an undertaking, up to 4% of the total worldwide annual turnover of the preceding financial year, whichever is higher. This is enough to shut down companies, so it’s essential you are ready for May 2018!